In contemporary educational contexts young children and learning are tamed, predicted, supervised, controlled and evaluated according to predetermined standards. 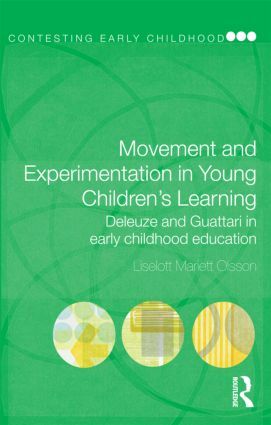 Contesting such intense governing of the learning child, this book argues that the challenge to practice and research is to find ways of regaining movement and experimentation in subjectivity and learning. the need to focus on ‘process’ rather than ‘position’, as positioning of any kind, such as learning goals or developmental stages, hampers movement. working with methods that recognise science’s inventiveness and productivity, demonstrating how the events in which children take part can remain open ended and in movement. Re-considering the dichotomy between the individual and society as a ‘cause and effect’ relationship, which immobilizes subjectivity and learning and hinders experimentation. Challenging dominant ways of thinking, Movement and Experimentation in Young Children's Learning offers new possibilities for change and provokes a re-evaluation of the educational system’s current emphasis on predetermined outcomes and fixed positions. This book provides researcher and students with a sound theoretical framework for re-conceptualising significant aspects of movement and experimentation in early childhood. Its many practical illustrations make this a compelling and provocative read for and student taking course in Early Childhood Studies.